Today's Jesse Tree Ornaments were based on the story of Adam and Eve. 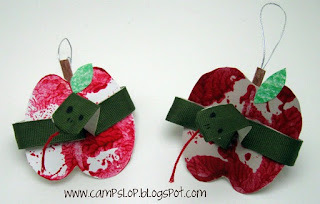 We read "The Sneaky Snake" in Pinky's Beginner Bible and then made an apple and snake ornament. 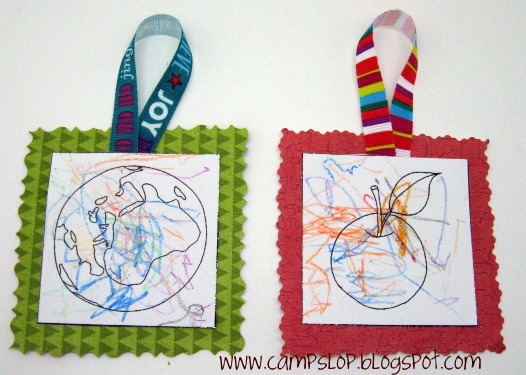 To make these, first I had the kids do apple prints on cardstock. Once they were dry, we cut them out and glued on a stem and leaf. Next, I made each of them a ribbon snake using this tutorial. We wrapped the snake around the apple and added a ribbon for hanging. Wild One joined us today and colored two ornaments. I mounted them on scrapbook paper and added a ribbon for hanging.